Occupational health and safety is relevant in all branches of industry, business and commerce including traditional industries, information technology companies, care homes, schools, universities, leisure facilities and offices. Occupational health and safety affects all aspects of work, that’s why high hazard manufacturing plant requires many different specialists, such as engineers (industrial, electrical, mechanical and civil), lawyers, medical doctors and nurses, trainers, work planners and supervisors, may be required to assist the professional health and safety practitioner in order to ensure that there are satisfactory health and safety standards. Generally, there are many obstacles in the process of achieve good health and safety standards. The pressure of production or performance targets, financial constraints and the complexity of the organization are typical examples of such obstacles. However, there are powerful incentives for organizations to strive for high health and safety standards. These incentives are moral, legal and economic. Corporate responsibility, a term used extensively in our days, covers a wide range of issues. It includes the effects that an organization’s business has on the environment, human rights and common welfare. Health and safety in the workplace is an important corporate responsibility issue. Corporate responsibility has various definitions, however, broadly speaking it covers the ways in which organizations manage their core business to add social, environmental and economic value in order to produce a positive, sustainable impact on both society and the business itself. 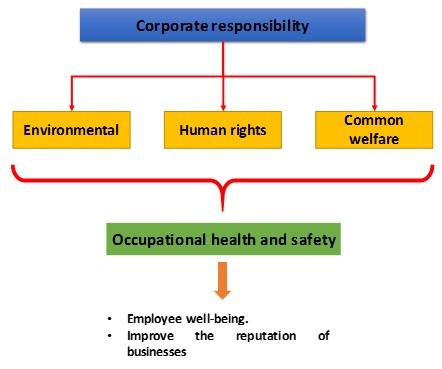 Terms such as corporate social responsibility and socially responsible business refer to this concept. report publicly on health and safety issues within their organization, including their performance against targets. is financially beneficial to business. Engineering to improve productivity based on productivity science. Communicated and implemented through people using productivity management.